The best electric guitars under $500 in 2019 reviewed right here! The Best Electric Guitars Under $500 in 2019: reviewed right here! Beginners serious about learning guitar would often skip the entry-level models and go for the best electric guitar under $500. There’s wisdom in this decision because at this price point you’re sure to have an instrument with better quality. Many guitars in this price range also have advanced features that can make it easier for beginners to transition to pro-level models when the time comes. And if you’re moving up from your starter guitar or are looking for a backup or secondary guitar for practice, the models in this price range prove to be worthy companions on your musical journey. Epiphone Les Paul Standard Electric Guitar Join the multitude of Les Paul players with the Epiphone Les Paul Standard, available in a number of finishes including Ebony and Faded Cherry Sunburst. The Les Paul Standard boasts the same specs as vintage Les Pauls and features a mahogany body paired with a maple veneer top. It’s equipped with Epiphone Alnico Classic humbucking pickups and Grover machine heads. PRS SE 245 Electric Guitar PRS electric guitars are usually inaccessible to most players but the PRS SE 245 is certainly one that you can afford if you have a budget of $500-$600. The PRS Paul Reed Smith SE 245 Standard Electric Guitar is also a fantastic option for those who prefer guitars with a shorter scale than usual. Fitted with 245 “S” pickups. ESP LTD EC-256 Electric Guitar The ESP LTD EC-256 looks amazing, sounds great and has a wallet-friendly price. Suitable for players of all skill levels and music genres, the LTD EC-256 features a mahogany body and a sturdy three-piece mahogany neck. This electric also has a short scale, making it easier to play for teens and petite players. The guitar bundle is recommended for beginners. Yamaha Pacifica 112V Electric Guitar Up next is the Yamaha Pacifica 112V, which looks like a Strat somewhat. Part of the Pacifica series guitars known for their playability and tone, the 112V looks, plays and sounds like a more expensive guitar. It has a solid alder body, a vintage-style vibrato and five-way switching of the pickups. Two single-coil pickups and one humbucker offer tonal versatility. Kramer Pacer Electric Guitar When performance is a priority, pick things up with a Pacer. The Kramer Pacer Classic FR guitar features the specs and styling reminiscent of the 1983 Kramer Pacer, much revered for its playability and versatile performance. The Pacer is equipped with a Floyd Rose tremolo system, Alnico pickups and a three-way mini toggle selection switch. It’s truly a modern classic. Fender Modern Player Telecaster Plus Electric Guitar Fender guitars under $500 always spark our interest, like the Fender Modern Player Telecaster Plus. The name of the model is quite a mouthful but that’s alright considering the guitar is packed with top specs. 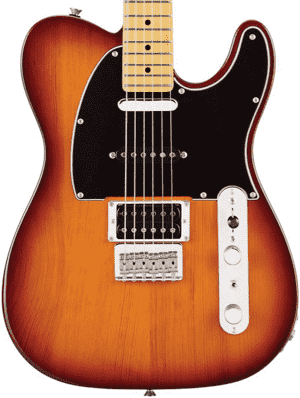 Part of the Modern Players series, this guitar features a glossed pine body, a classic Tele maple neck, vintage-style hardware and an HSS pickup configuration. Schecter Omen Extreme 6 Electric Guitar Another fantastic Floyd Rose-equipped guitar is the Schecter Omen Extreme-6, which also features some pretty sweet specs for its sub-$500 price tag. The Extreme--6 has a mahogany body with a quilted maple top for comfort and visual appeal, a maple neck with a rosewood fingerboard, Schecter Diamond Plus pickups, a three-way toggle switch and a Floyd Rose Special bridge. Schecter Demon 6 Electric Guitar After the Omen comes the Demon. The Schecter Demon-6 can definitely lure you into playing some wicked tunes with its sleek, contoured body shape and brand-new Schecter Diamond Active pickups. The basswood body and bolt-on maple neck make the Demon-6 an extremely sturdy instrument to shred on and the no-nonsense controls give you the freedom to focus on your music. Danelectro Baritone Electric Guitar A Danelectro Baritone electric guitar is our last but definitely not the least pick for this category. The ‘56 Baritone makes it as one of the best electric guitars under $500 because it stands out. As a baritone axe, it has a longer scale length and thus offers deeper, lower tones and a wider range of sounds than standard-scale guitars. Make your first or next guitar a Les Paul! For $500, you can get an iconic guitar that would make playing a truly satisfying experience. The Epiphone Les Paul Standard has the features and tone of a vintage Les Paul without the bank-breaking price tag. The Les Paul Standard by Epiphone boasts the classic solid mahogany body with an arched carved maple veneer top for that much-loved vintage look and sound. The neck is also made of mahogany and features a set construction like a Les Paul should. The solid glued neck joint provides excellent stability and contributes to the guitar’s sustain. The neck also features a 1960’s SlimTaper D profile for a comfortable and vintage playing feel. Topping the neck is a punchy pau ferro fingerboard with pearloid trapezoid inlays and medium-jumbo frets. The Les Paul Standard is equipped with an Epiphone-designed Alnico Classic humbucker at the neck and an Alnico Classic Plus humbucker at the bridge. As for the controls, it has an Epiphone all-metal three-way pickup selector and individual volume and tone knobs for each pickup. And as with the classic Les Paul guitars, the Epiphone Les Paul Standard also has a Tune-o-Matic bridge and stopbar tailpiece. If you’re looking for a short-scale electric guitar, the PRS SE 245 is certainly one of the best you’ll find at the $500 price tier. The guitar takes its name from its 24.5-inch scale length. The shorter scale is great for beginners and petite players with small hands. The PRS SE 245 also has a single cutaway, which makes it a lot easier to access the upper frets. It’s a great feature to have along with the short scale length. The SE 245 has a bound mahogany body and neck as well as a rosewood fingerboard with 22 frets and the classic PRS bird inlays. The neck has a Wide Fat neck shape, which has a deep profile and longer heel. This neck shape contributes to the guitar’s sustain and warm tones. As for the electronics of the PRS SE 245, it has 245 “S” treble and bass pickups. The guitar has volume and tone controls for each pickup and located on the upper bout is a three-way toggle pickup switch. Other top specs include nickel hardware, a PRS-designed stoptail bridge and PRS-designed tuners. The Tobacco Sunburst finish is a favorite and there’s also a Whale Blue color option. The ESP LTD EC-256 has a 24.75-inch scale length, putting it within the category of short-scale electric guitars like the PRS SE 245. Aside form the short scale, the ESP LTD EC-256 has other noteworthy features that make it one of the best electric guitars under $500. It has a mahogany body and flamed maple top, which together produce a rich and warm focused sound with a bright and projecting tone. The set neck is also made of mahogany and is made from three pieces of wood, making it sturdy and durable. The fingerboard is made of rosewood (roasted jatoba on some models) and has 22XJ (extra jumbo) frets. The single cutaway allows for easier upper-fret access. The ESP LTD EC-256 is also equipped with a Tune-o-Matic bridge and tailpiece, allowing for more intricate string adjustments when necessary. The bridge and tailpiece combo provides great sustain and stability. Pickups come in the form of an ESP-designed LH-150N pickup at the neck and an LH-150B pickup at the bridge. There are two controls for volume (one for each pickup), one push/pull tone knob and a pickup toggle switch. Beginners can save money on accessories by purchasing the guitar bundle. Yamaha offers really good electric guitar models at every price tier, so no matter your budget, there’s sure to be a Yamaha guitar out there for you. The Yamaha Pacifica 112V could be your first or next electric guitar if $500 is your spending limit on a quality axe. With a solid yet lightweight alder body, maple neck, rosewood fingerboard and HSS pickup configuration, the Pac112V exceeds expectations. On first glance it looks like a Stratocaster, but take a closer look and you’ll find plenty to appreciate about the PAC112V other than its looks. The maple neck has a bolt-on construction and sports a C-shaped profile. The rosewood fingerboard has 22 frets. It’s smooth and built for speed so you can do fast runs whenever and as often as you want. There’s also a vintage-style tremolo bridge with six fully adjustable saddles. Together with the tuners, the bridge works well to keep the guitar properly intonated. The Yamaha Pacifica 112V has single-coil pickups at the neck and middle positions and a humbucking pickup at the bridge. This pickup combo allows for exceptional tonal versatility. Tone shaping is easily done via the five-way pickup selector and volume and tone controls. Kramer electric guitars were some of the best-selling guitars in the 1980s, endorsed by famous musicians such as Richie Sambora (Bon Jovi), Neal Schon (Journey), Brad Gillis (Ozzy Osbourne) and Edward Van Halen (Van Halen). The Kramer Pacer Classic FR Electric Guitar is faithfully designed after the 1983 USA Pacer, making this model truly a modern classic. It is built with heavy metal and hard rock guitarists in mind, and features specs that are based on the ‘83 model, from its body construction to its electronics. The Pacer Classic FR has a mahogany body and a one-piece maple neck with a thin tapered C-shape. It’s topped with a maple fingerboard with 22 medium-jumbo frets. A locking nut helps significantly in keeping the guitar in tune. Neck-wise, the only difference between the original Pacer and the Pacer Classic is that the truss rod adjustment is moved to the headstock. This Pacer also boasts a licensed Floyd Rose tremolo bridge, black hardware, classic Alnico magnet humbucking pickups (the 900R at the neck and a 910T at the bridge) and a mini three-way pickup toggle switch. There’s also a master tone control and a treble bleed mod added to the volume controls. With its classic Tele looks, modern HSS pickup configuration and other features that guitar players would love, the Fender Modern Player Telecaster Plus is a prime candidate as your go-to instrument. The Telecaster Plus is part of the Modern Player lineup, which boasts unconventional takes on the classic models. The Tele Plus, for instance, has three pickups instead of the standard two single-coils. There’s a single-coil Tele pickup at the neck, a Stratocaster pickup at the middle position and a humbucker at the bridge for more tonal variety. With the three pickups is a five-way pickup switch, but that’s not all. There’s also a mini-toggle switch for the bridge pickup for coil splitting. And of course, it wouldn’t be a Tele without controls for the master volume and tone. This Tele’s body is made of pine, just like some of the Fender guitars of old. The pine body delivers a tone that’s warm with an even frequency response across the spectrum. The C-shaped neck is made of maple and adds sustain and brightness. The body and neck are given a gloss polyester finish. The Modern Player Telecaster Plus also has a vintage-style string-through-body hardtail bridge, like that of a Strat. Great specs and an affordable price come together in the Schecter Omen Extreme-6, our next pick for this list of best electric guitars under $500. Although a lot of Schecter guitars are designed for those who play the ‘heavy’ stuff, the company has always built reliable instruments for guitar players across various music genres. The Schecter Omen Extreme-6 is an electric guitar that can match any musical mood with its pair of Diamond Plus pickups at the neck and bridge positions. There are two controls for volume and one for tone with a push/pull coil tapping feature so you can get those single-coil sounds. A three-way switch lets you experiment with various tonal outputs. The Omen Extreme-6 also looks amazing with its mahogany body with a quilted maple top and multi-ply binding. The maple top has an arched contour for a nicer playing feel. The neck is made of maple and topping it is a rosewood fingerboard with 24 extra jumbo frets and vector inlays. The Tune-O-Matic with String Thru Body bridge design adds sustain and makes string adjustments a whole lot easier. On the Omen Extreme-6 FR model, there’s a Floyd Rose Special keeping the guitar in tune. This is one Demon you’ll be glad to have on your side. The Schecter Demon-6 electric guitar is packed with the specs you need to get you started on the right track or level up your playing. With a built-to-last basswood body and a bolt-on maple neck with a thin “C” shape, the Demon-6 offers a sturdy and comfortable means of showing off – or improving on – your shredding skills. The fingerboard is made of wenge, a top alternative to rosewood (which can still be found on some models). There are 24 extra jumbo frets to make it easier for you to bend notes when playing your riffs, runs, licks and solos. The sleek fretboard also features gray pearloid Gothic crosses as position markers. The Graphtech Black Tusq nut and black chrome hardware adds to the aggressive look. The guitar’s tough appearance is complemented by its electronics. The Demon-6 boasts Schecter Diamond active pickups at the neck and bridge. These humbuckers are specially designed for those face-melting metal solos. There are controls for the volume and tone as well as a three-way toggle for switching between pickups. The Tune-O-Matic string-through bridge keeps everything in tune and makes string adjustments a breeze. Back in the ‘50s, the Danelectro Company came up with something novel in the realm of musical instruments: an electric guitar that’s larger with a heavier internal bracing and a longer neck. Essentially it was a 6-string bass, but it became more popular as a baritone guitar. Other manufacturers like Fender soon followed suit. The Danelectro ‘56 Baritone is a model that pays homage to that era of the birth of baritone electric guitars. It has a traditional build with a long scale length of 29.75 inches. The tuning is also that of a traditional baritone: a perfect 4th lower than the tuning on a standard electric guitar. Instead of E-A-D-G-B-E, it’s tuned B-E-A-D-F♯-B. The chord patterns are the same as that of standard guitars, just with a lower voice. This Dano is a fantastic guitar to have if you’re looking to expand your tonal range or add to your sonic arsenal. The ‘56 Baritone solid body electric guitar features a maple neck with a rosewood fingerboard, a dolphin headstock design and vintage-style and versatile ‘lipstick’ single-coil pickups. Both neck and bridge pups do their job excellently, delivering a distinctive tone you’ll want to hear again and again. Those are our top recommendations for the best electric guitar you can get for under $500. We hope you are able to find one or two that would fit your musical tastes and playing style. The guitars on this list each has its own set of qualities that make it better than the rest depending on what you’re looking for. For instance, if you’re on the hunt for an axe that would effortlessly complement heavy metal music (and the sinister-looking black outfits that usually come with it), nothing can match the Schecter Demon 6 in our humble opinion. Or if you’re looking for something that reflects your love for classic rock, there’s the Les Paul Standard for you, as well as the Tele. Whatever music you like or however you play, we’re certain there’s a guitar for you in this list. Explore them one by one. If a particular mode really interests you or you feel you connect with it on a deeper level, our advice is to keep on reading and learning about it. Watch demo videos where you can get a closer look at the guitar and how it sounds. Better yet, visit a music store to see if they have these guitars in stock. If they do, go ahead and give them a try. Take note not only of how they sound but also how they feel in your hands. Take time to get a good feel of the guitar. Keep in mind that the guitar you choose is one that you’ll be playing for hours and not just while sitting down. Playing comfort is important when choosing an electric guitar, which by default is quite heavy compared with acoustic guitars. Once you’ve decided on what you think would be the right electric guitar for your needs and preferences, negotiate for the best price or come back online for the best deals on electric guitars. Here’s a short recap of the top electric guitar models under $500 and their best features. 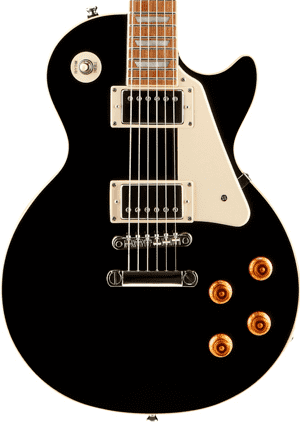 ● Epiphone Les Paul Standard – just like a classic Les Paul guitar in looks and sound. Equipped with Alnico Classic humbuckers. Ideal for beginners and intermediate players. ● PRS SE 245 – short-scale electric guitar, ideal for beginners and players with small hands. Fitted with PRS 245 “S” pickups. A good deal on a PRS. ● ESP LTD EC-256 – short-scale electric guitar, just .25 inches longer than the PRS SE 245. Boasts LH-150 pickups designed by ESP. Also good for novice players. ● Yamaha Pacifica 112V – three pickups for a wide range of tones. Looks like a Strat and offers the same tonal versatility. Best for intermediate players and as a backup guitar for working musicians. ● Kramer Pacer – based on the iconic 1983 USA Kramer Pacer, has a Floyd Rose tremolo bridge system and Alnico magnet humbuckers. A very good instrument for intermediate and advanced players. ● Fender Modern Player Telecaster Plus – has three pickups, which is uncommon for a Tele: a single-coil Tele pickup, a Strat pickup and a humbucking pickup. A good option for beginners who would like to get started with a three-pickup configuration. 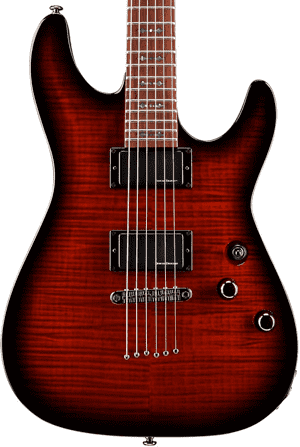 ● Schecter Omen Extreme 6 – great looks and there’s an option to get the variant with a Floyd Rose Special system. Ideal for players requiring a high output. ● Schecter Demon 6 – built for ‘heavy’ stuff with the aggressive looks to match. Boasts Schecter Diamond humbucking pickups. Designed for players with a hard and loud playing style. ● Danelectro Baritone – baritone electric guitar with a longer scale length and extended tonal range. Single-coil pickups capture the lower voicing seamlessly. Great for players of all levels who are interested in playing a guitar with baritone tuning. Eight out of the nine guitars on this list have standard tuning, that is E-A-D-G-B-E. Only the last one, the Danelectro ‘56 Baritone, has a different tuning, B-E-A-D-F♯-B, which is why it’s called a baritone guitar. Baritone guitars may not be as popular as those with standard tuning but they’re a really great addition to any collection and a must-have for musicians looking to expand their tonal repertoire. Baritones are the same as standard electric guitars up to their chord patterns but because of their tuning, they have a lower voice. The Dano Baritone we’ve included in this list is tuned a fourth lower than standard. Baritone guitars can also be tuned a fifth lower, A-D-G-C-E-A. One common question that beginners ask is, “Why can’t I just tune my guitar lower?” Well, technically you can tune a standard guitar lower, but the strings would then be too loose or floppy. They would not have the tension necessary to produce a good sound, or any sound that can be of use to your playing. For an electric guitar to be able to be tuned lower while retaining string tension, its neck should be longer (and thus have a longer scale length) and the strings should be just a little bit heavier in gauge. Sounds familiar? It’s how a bass guitar is built. This is the reason why baritone guitars are also referred to as 6-string bass guitars. The different tuning shouldn’t keep guitar players (who are used to standard tuning) from playing a baritone guitar. The tuning is just lower and each and every chord pattern you know can be played in the same way on a baritone guitar. When you try to play a song or lick you’ve memorized using the same chord patterns, it’s going to sound the same, only lower in pitch with a darker color and a more haunting texture. If you’re into blues or jazz, a baritone guitar would be a perfect addition to your arsenal. Baritone guitars are great for performing and recording music artists who want to expand their tonal range. A baritone can fit in nicely with a variety of genres, from pop and folk to rock and heavy metal. What’s great is that the voice of a baritone guitar is low enough to be heard or stand out in an ensemble with a guitar with standard tuning, yet still high enough so it doesn’t get drowned out by an electric bass guitar. So when you’re out shopping for an electric guitar, do take a look at those with the longer scales and lower tuning. You’ll never know what you can come up with when you play a baritone guitar.